A more cautious president might not have praised the fact that there were only 16 recorded deaths in the aftermath of a major hurricane. A more cautious president would not have then disputed a death toll — 2,975 — that turned out to be much higher and was embraced by the local government as official. But here we are. The president, without evidence, has accused Democrats of manufacturing a number to make him look bad. We will leave aside the conspiracy theories. Let’s take a look at the numbers and explain why they have been so fuzzy. But one thing is clear: There were far, far more than 18 deaths. The Puerto Rico figure jumped to 34 later that day, and then eventually 64. The Puerto Rican government then came under fire for what many experts said was a too-low figure. In the chaos of the natural disaster, officials had failed to properly document whether deaths on the island were related to the storm. Ordinarily there would be a better distinction between “direct deaths” — such as people who drowned in a storm surge, were hit by lightning or died when a building collapsed because of winds — and “indirect deaths," such as heart attacks, house fires, electrocutions from downed power lines, vehicle accidents on wet roads and so forth. So the government froze the death toll at 64 and asked George Washington University’s Milken Institute to examine the data. For months, the government refused to release any death figures until the report was completed. The more-complete Puerto Rican figures released in June showed an increase of 561 deaths in September over the same month in 2016, an increase of 683 deaths in October, an increase of 187 in November and a decline of 34 in December. That added up to a 1,397 increase in that four-month period. The new Puerto Rican numbers were somewhat higher than those estimated in studies carried out by media organizations and academic institutes. The general focus was on studying whether there were excess deaths — more deaths than would be expected in the absence of the storm. Since Puerto Rico is an island and few people could evacuate, it was practical to estimate excess deaths in a certain time period. University of Puerto Rico at Mayagüez professors calculated 822, with a 95 percent confidence range that the total was somewhere between 605 and 1,039. Alexis R. Santos-Lozada of Pennsylvania University and a colleague calculated excess deaths of about 500 in September, or a total of 1,085 if the same pattern held in October. In a research note published in the Journal of the American Medical Association, they reported that the inclusion of the December deaths indicated an excess death toll of 1,139. Broadly, then, a range of expert analyses found that more than 1,000 people died than expected in the immediate aftermath of the hurricane and the relief effort. Then, in August, GWU released its report, estimating excess deaths at between 2,658 and 3,290, with a midpoint of 2,975, in the six months after the storm made landfall. The investigation, based on actual death certificates, compared the number of deaths with typical death rates, adjusting for many variables, including the mass exodus from the island in the aftermath of the storm. GWU said it counted deaths until February because people continued to die at anomalous rates long after the storm, as the island struggled with infrastructure failures and political infighting. GWU said that the poorer and older the resident, the higher the risk of death, especially among men older than 65. So the number might include an elderly person who died earlier than expected because there was a lack of electricity at home or health-care facilities. The study, in other words, purposely tried to avoid simply counting elderly people who “died for any reason,” as Trump claimed. GWU researchers said otherwise the count would be 16,608 between Sept. 1 and the end of February. Note that GWU’s September-February period of research was longer than the earlier studies. To provide an apples-to-apples comparison, GWU estimated 2,098 excess deaths through December (the period also covered by the Harvard study) and 1,271 for September and October (the period covered by most of the other studies). When adjusted for the time factors, all of the studies, except Harvard, are broadly consistent. After the release of the report, the government of Puerto Rico embraced 2,975 as the official death toll. But it’s important to remember that this was the midpoint of an estimate. The Federal Emergency Management Agency, as of Sept. 5, has paid benefits to the families of 247 people whose deaths the agency confirmed were related to the storm, CNN reported Tuesday. FEMA said 3,005 people had applied for that assistance in relation to deaths that occurred after Maria or Hurricane Irma, which struck the island just before Maria, with more than 2,350 still being processed. The official figure embraced by Puerto Rico is an estimate of “excess deaths,” based on a six-month period after the storm. One might quibble with extending the period under investigation for that long, but few areas of the United States have suffered so long without electricity or drinking water in the aftermath of a natural disaster. Moreover, in any part of the United States, 3,000 excess deaths in six months would be considered a crisis, worthy of an intensive investigation to find out what went wrong — rather than a tweetstorm that minimizes the problem. Even the most conservative estimate, looking just at the excess deaths through October, is above 1,000. 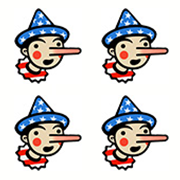 Trump’s tweets are missing a few digits, and thus earn Four Pinocchios. “3000 people did not die in the two hurricanes that hit Puerto Rico. When I left the Island, AFTER the storm had hit, they had anywhere from 6 to 18 deaths."